to Africa. Le Dune Piscinas is recommended for travellers who are looking for a unique experience with nature. The mobile phones do not work well, the rooms have no television ... a paradise for those who need to escape from reality! Le Dune Piscinas Ecoresort & Beach is located at the West-Coast – on the Costa Verde a nature wild area – in between of Capo Pecora and Capo Frasca. The hotel is directly on the beach and around 150m from the sea away. The location of Ingurtosu together with Montevecchio was one of the most important mine is area of Sardinia until the mid of the last century. This mine-village was populated up to 5000 people until the end of the sixties and it was the head office of all mine of Ingurtosu and Gennamari. From its importance back to history, the UNESCO declared this region of industrial mines as archaeological monuments and the whole territory “World Heritage”. Very nice beaches and close to reach are Scivu, S’Acquarucci and Torre die Corsari. Charming recommends to rent a car to those who choose this hotel. For bookings including half board basis please contact directly our booking office per e-mail or call at +39.070.513489. From an old storehouse of the mine around the year 800, this unique and magnificent hotel has been built, it is a peaceful place away from the tourism of mass. The Le Dune Piscinas offers one se front restaurant, one Caribbean gazebo, where a lunch buffet is served during some period of the season, an American Bar and a TV-room. The Wi-Fi internet connection is available free of charge in the public areas. A private area on the beach is equipped with sun beds and umbrellas for hotel guests, available from June to September. The Le Dune Piscinas has 26 rooms and Suite with the possibility to add (on request) a 3rd or 4th bed. They located either on the ground floor or on the first floor of the main building and face either the “Piazzetta Ponente” or the “Piazzetta delle Ancore”. 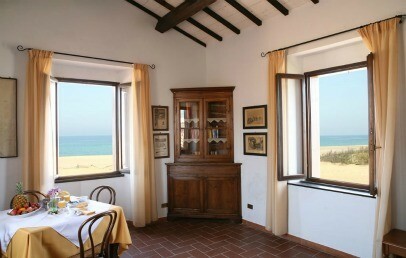 The rooms located on the first floor offer either view on the sea or lateral on the dunes. All rooms have a bath with shower, hairdryer, mini fridge, safe and central air condition. Beach towels are available with a supplement and are available at the reception. The Master Suite is a mini apartment located on the first floor, fulfilled with light, with frontal sea view and lateral view on the dunes, an ideal accommodation for a couple, who like to spend their holiday on a more comfortable area. The Suite has one bedroom with bathroom with Jacuzzi-shower, wardrobe in a separate room, a living room and the same amenities as the other rooms, in additional with a TV with satellite channels. Various treatments for beauty and traditional massages to enhance your relaxing stay on this beautiful peaceful spot of land are offered, open from June to September. An outdoor whirlpool is at clients disposal, free of charge. The Chef offers their guest a variety of delicious Sardinian plates, combined to delicious best Sardinian wines. 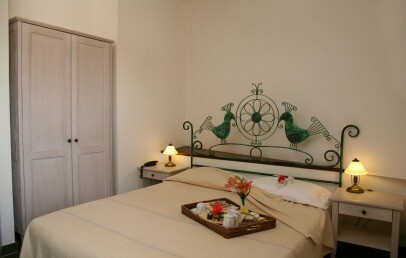 Cosy double room with wooden furniture and details are typical of Sardinian style. The private bathroom is equipped with shower box and hairdryer. No TV. Large and bright double room located on the ground floor in the main building. Wooden furniture and details are typical of Sardinian style. The private bathroom is equipped with shower and hairdryer. The Superior rooms on the ground floor have french windows and a tiny terrace with garden view. No TV. Exclusive Suite sets in the 1st floor of the first building, the one nearer the sea. 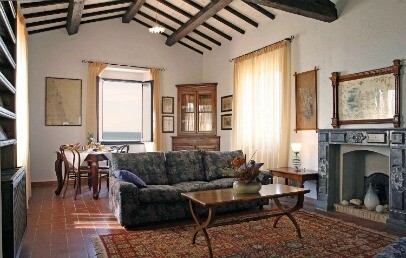 Wooden furniture, terracotta floor tiles and refined details are typical of Sardinian style. It consists of a double room with walk-in closet and bright living room with fireplace and sat Tv. The bathroom has a Jacuzzi shower and hairdryer. The Suite has a frontal sea view and a lateral view on the dune. Large and bright double room located on the first floor in the main building. Wooden furniture and details are typical of Sardinian style. The private bathroom is equipped with shower and hairdryer. The rooms enjoy sea view a/o lateral dune view. No TV. Only for Charming customers: farewell gift!